Double Down Jackass Trucker Cap - Dark Brown Brushed Twill and Tan Polyester Mesh | BUDK.com - Knives & Swords At The Lowest Prices! The designers at Double Down have done it again - introduced yet another stylish, uproarious retro trucker-style cap for your wearing pleasure! 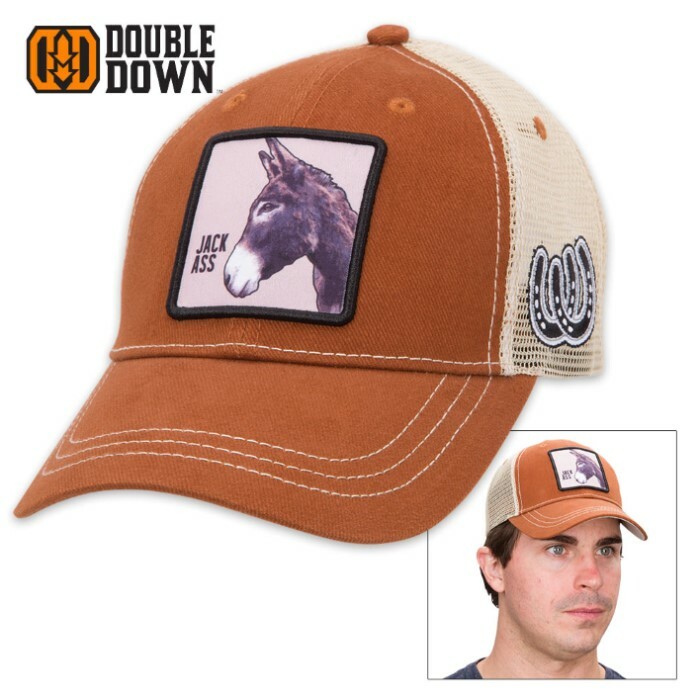 The star of this American-designed cap is the noble donkey, or “Jackass,” as he is affectionately dubbed in printed letters beside his portrait on the cap front. Warn everyone who sees you wear this cap that you’re a real piece of work - a “jackass,” some might say. Are you a Republican with a Democrat friend? Poke lighthearted, gentle fun at him or her with this cap, featuring the leftwing party’s mascot front-and-center. Or maybe you’re a proud Democrat who wants to let the world know you can take a joke even in today’s stern, often mean-spirited political climate; donning this cap is a perfect, amusing solution. 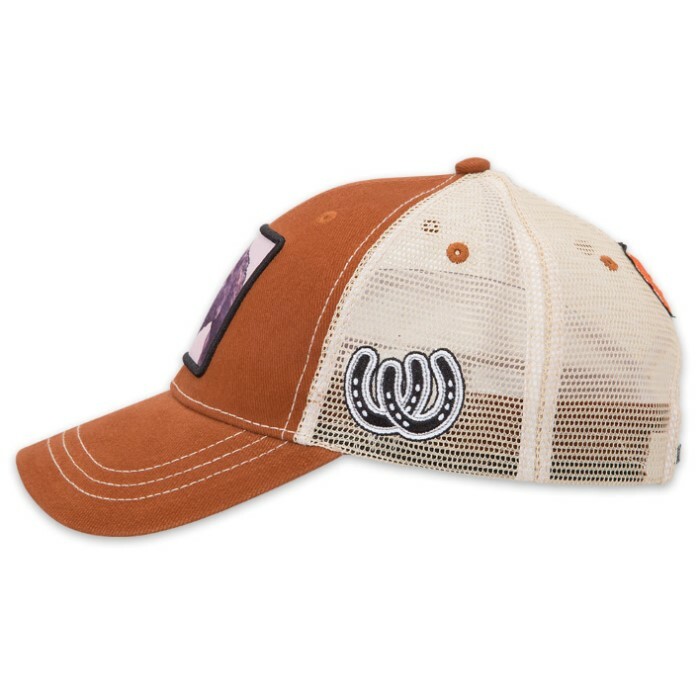 The cap’s brim and front are rustic dark brown heavy brushed cotton twill, and the back and sides are a complimentary light tan polyester mesh. This style and color scheme pairs well with jeans, suede, khakis, etc. - virtually everything; and with its well-ventilated, cool, comfortable fit, this cap is easy to wear anytime, anyplace. Its off-color humor is mild enough to get away with it, too. 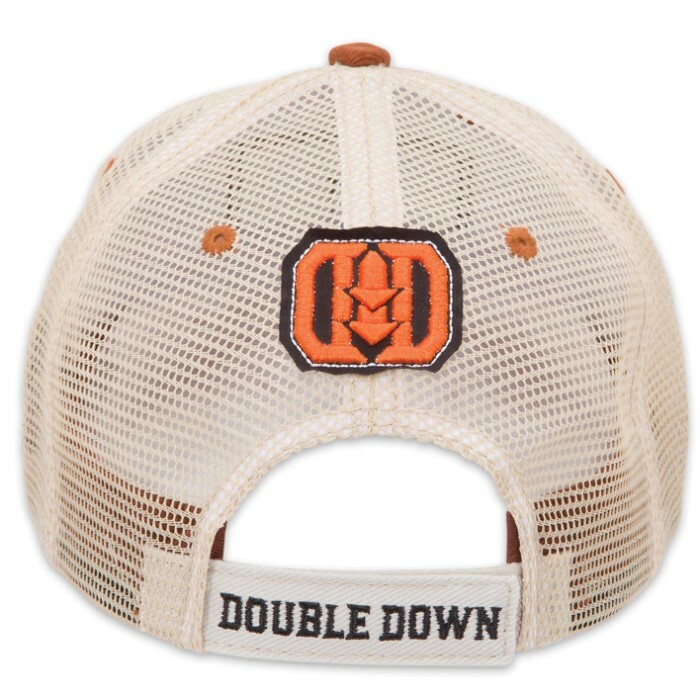 Two horseshoes are embroidered in black on the left side, and the back is stamped with the Double Down logo in orange and black embroidery. “Double Down” is emblazoned in all capital letters across the adjustable Velcro back strap. One size fits most.